Leaving ComedySportz, where Sarah had a show, on our way to a party, a stranger stopped in front of us on the street and said, "Happy New Year. Do you two have any resolutions." "Not really, not yet," we said. Although, we actually kind of did. Lose weight. Save money. 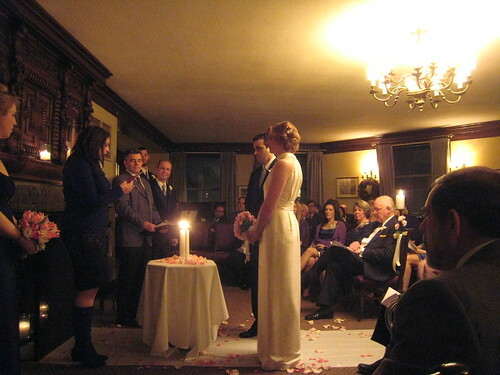 Really mostly wedding resolutions. "What about you?" I asked, "What's your resolution." The stranger thought for a second, then said, "I do have a resolution. I'm gonna keep being me." "Well, good luck with that," I said as he walked away. Hansen: Congratulations on being able to invite me to your wedding. I got back to Chicago to find Sarah feverishly doing wedding research online. She seemed a little stressed out. Me: Look, it’ll be okay. We’ll just prioritize. Here’s my list of importance. One… your dress. Sarah: Really? You’re not just saying that? Me: It’s important you look good. Two… booze. Three… friends, having our friends be there. Four… venue. And then everything else. Sarah: Do you want to hear my list? One… everything. [laughs nervously] And two.. everything I haven’t thought of yet. Since I've been in Ohio a while, I thought I'd try to record an installment of my Stupid Nerd podcast. The only problem is that no one in my family is all that nerdy. So I did a short interview with Ty and Will a cartoon show they like, 'Ben 10.' Ty explained the concept of the show and a few of the episodes, while Will mostly giggled and occasionally said nonsense like, "Cha-cha!" Me: Is there someone named Cha-cha? Ty: No. Will's just saying weird stuff. Afterward I let them each listen to the a few minutes of the recording. Ty seemed slightly hypnotized by his own voice, occasionally smiling a little to himself. Will didn't seem that interested, taking the earbuds out fairly quickly. Me: Didn't like it Will? Will: It's okay. Some of it is silly. The podcast probably won't be up for a couple weeks, but in the meantime, you can listen to some of the old episodes here. 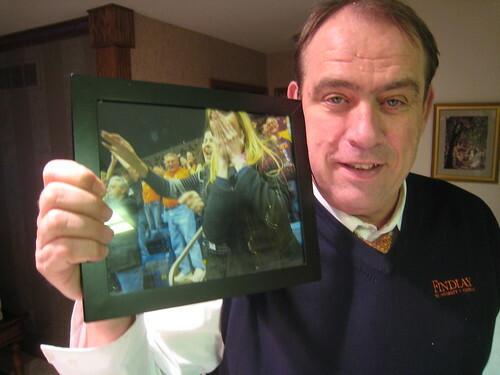 For Christmas I gave Dad this framed picture, taken the second after his team won the national championship game (on a last second Hail Mary three-pointer, no less). You can see my mother and my sister, Sherry, having a sort of religious experience. Julie: I like it. It captures the moment. Mom: Oh, I look terrible. Ron, that is not going up in your office. Sherry: Wait... why were you taking a picture then? Mom: That picture might disappear. It's hard to follow up an undefeated championship season. So far it's gone okay. They're already not undefeated, but they're winning more than losing. Sarah flew back to Chicago yesterday for a family event, a christening. When she was gone I thought I'd have a few days of not hearing, "let me see the ring," but I realized that, out in public, the same thing happens to my dad. People want to see the championship ring. Sitting in a booth at Outback Steakhouse, men walking by stop and say, "Coach, I gotta see the ring," or, "The ring. Show me the ring." 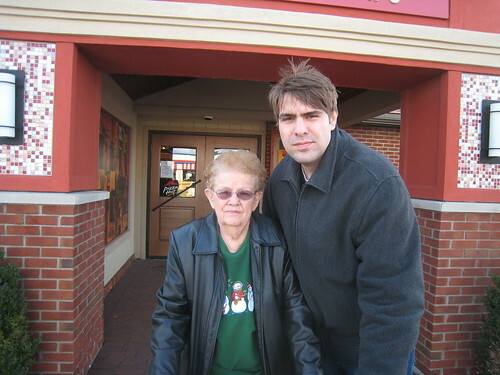 The usual holiday tradition of the family taking Grandma out to Pizza Hut. "Is this the one?" Grandma asked, meeting Sarah for the first time, and then, "You did good," referring, I think, to both the ring and Sarah in general. I take this compliment to be sincere since she is usually pretty straightforward. Me: What do you think of my new haircut? Grandma: Well... it's not really my style. On the way out I handed my camera to Mom and asked her to take a picture of the two of us. We must have been confused about exactly when the shot was being taken, because we're not even smiling politely. Me: [showing picture to Grandma] Oh man. [laughing] We are not smiling at all. Grandma: You're not even smiling. Christmas Day in Ohio at my sister's house. Julie said that Ty and Will are really into 'Star Wars' and superheroes right now. Sarah and I decided to get them something that doesn't make noise, and something that doesn't have a lot of tiny parts that will easily get lost. So we got them these oversized cartoony versions of semi-obscure (to little kids anyway) Marvel superheroes, Ghost Rider and The Thing. They didn't seem to know what to make of the toys (as you can see in the bottom left corner, neither did Allie), but Will started calling his toy Underwear Man, which sort of turned everything around. Little kids might not care about The Thing, but they sure do love Underwear Man. Christmas Eve in the suburbs with Sarah's family. There were lots of congratulations and compliments on the engagement and ring, even though I think everyone already knew it was coming. In fact, I think her whole family knew by the end of the day that I asked for her grandfather's permission. That's the way families are. During the White Elephant/Yankee Swap/Dirty Santa gift exchange last year I thought it would be amusing to bring Sham-Wow as my contribution to the swap. It wasn't as big a hit as I'd hoped, and frankly no one had heard of it before. You always feel bad for the person saying, "Hey... don't forget you can steal this things. This... uh... this Sham thing. Still up for stealing." This year I just brought a bottle of scotch, and it was stolen three times (the game limit). So, I'm learning. 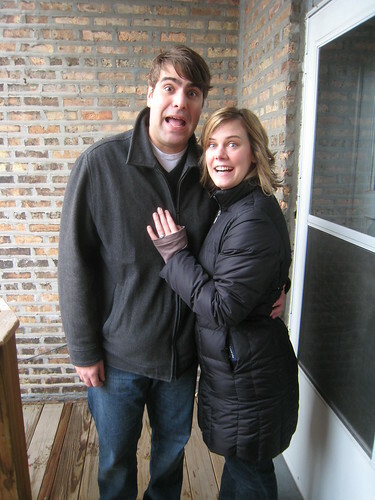 I don't think either of us are particularly happy with the way we look in that engagement picture I posted. I say, "You look cute but I look terrible." And then Sarah says, "No. I look terrible. You look cute." 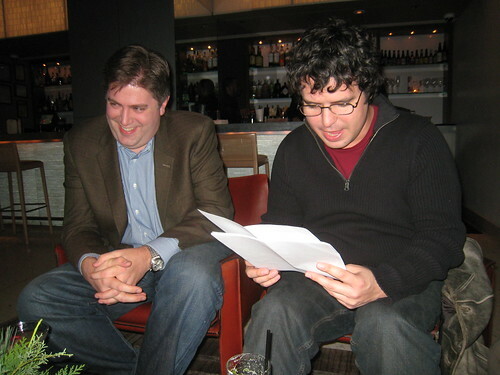 I mentioned that I think I sort of look like a Muppet in the picture, thick-headed with a gaping mouth. 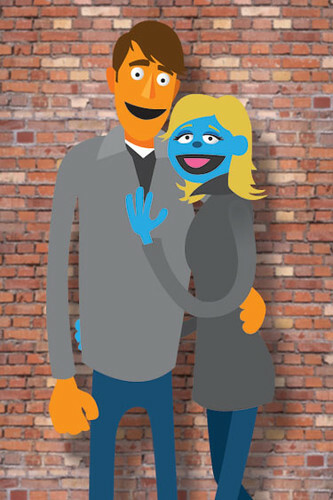 So our friend Gilley did this reimagining of our engagement photo if we really were Muppets. 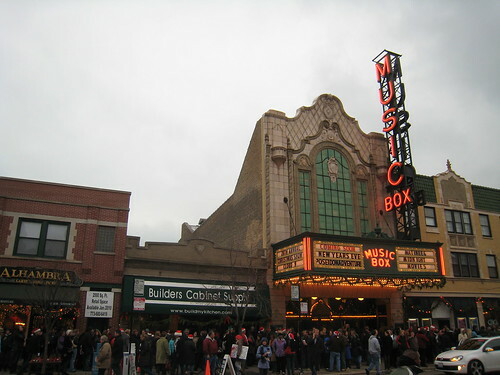 After the proposal on Sunday we went to see 'It's a Wonderful Life' at the Music Box, a beautiful old Chicago theater. It was a nice film to see in the first hours of our engagement, about how the support of family and friends can make you "the richest man in town" (and only slightly about how a man feels so trapped by responsibilities to work and home that he's driven to suicide). An organist led the packed house in singing Christmas carols beforehand and it was all very Christmas-y and we-just-got-engaged-y. My still-recovering back ached a bit from sitting in the theater seat for so long. I had to get up a few times during the movie to walk around. My back is mostly better now, but I was a little worried during the days leading up to the engagement, most of which I spent laying down, resting, worrying about the fact that my proposal plan involved climbing three flights of icy back porch stairs. Saturday night, the night before the proposal, I hobbled into the bathroom, locked the door behind me and secretly practiced getting down on one knee and getting back up, just to make sure I could do it, and that I wouldn't get stuck, clutching a ring and clutching my back. All social announcements and exchanges seem to be funneled through Facebook these days. We had to put a little thought into when exactly we'd update our relationship statuses (stati? ), because it's like setting off a "we're getting married" bomb amongst our friends, friends of friends, and random improvisers who we don't really know. 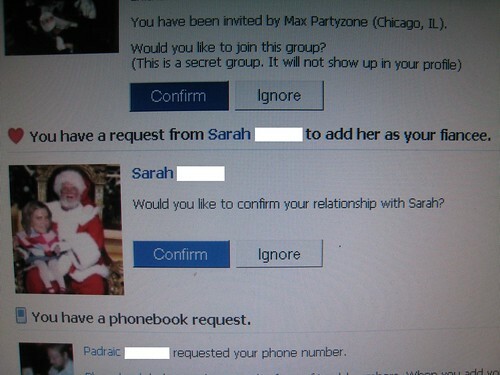 Sarah had to send me a "change of relationship" request, which I confirmed. Her own little online version of asking me to marry her. By the way, if you get engaged, and your fiancee sends you a Facebook request about it, it may take you a little while to find it on the Requests page. You'll have to scroll down below Friend Requests, Friend Suggestions, Event Invitations and Group Invitations. Sarah's Facebook Status: "Sarah has decided that Arnie will now be referred to as 'The fi-ARN-ce.'" So now the chicken and the bear are keeping each other company. Going back to Sunday for a moment, during the Christmas dinner with the guys, Hansen got Young (and all of us) a pretty wonderfully ridiculous gift. Hansen: It'll be out in April. You'll all get hardbound copies. And I'm sending two copies to the Library of Congress so it'll be officially listed, and you'll be able to request a copy from any library in the country. Also, I think you'll be able to order it from Amazon and a copy will be made for you. "The white boatship creaked, and its creaks were loud, creaking as it was through the thunderous waves and their slappy wavelings that surrounded the ivory boatship as truly an ocean surrounds a boatship as it sails. And this one was sailing. It contained passengers of legend who rode on it and in it, and on occasion, above it, with their possessions in luggage of leather -- several made of beastface -- the very skins of the faces of ferocious beasts -- and with enough foodstuffs to last the expected length of the journey. Six of your Earth weeks, if you must know. And now you do, Dearest Reader. . Every provision had been thought of: dragon shanks, to make one sluggish with satisfaction and magic; cloven-hooved-beastcheese, and various salmon. Barrels and casks and flasks and skins held a veritable encyclopaedia of the thirst-quenching arts: cloudwaters, curly-haired-baa-crying-beastmilks, lakemoists, riverwets, and wines. Many on-board games of jinxcards and spelljacks ended in riotous laughter brought on by these intoxicating elixirs of fruit, and water, and magic. " Hansen: All of you appear as characters. Meador: Our names appear in there? Hansen: Well, you all have weird Tolkienesque pseudonyms. Young: [laughing] What a weird crazy thing to do. Young: Great, sure, really great, but... it's such a weird thing to spend all this time on. Me: I feel like this is going to lead to Hansen accidentally becoming a bestselling novelty book writer. Hansen: Keep reading. Keep reading. You're almost to the part about how everybody's gay. The holidays are taking their toll. 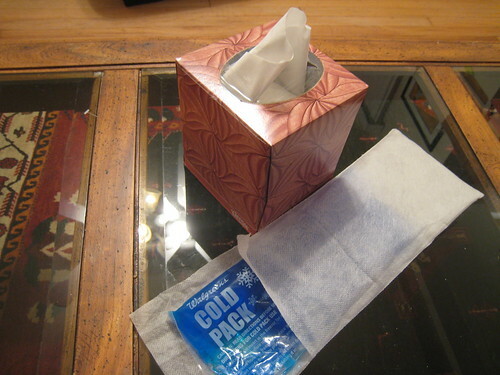 I've come down with a cold and somehow hurt my back. It's a horrible combination. Coughing makes my back hurt. Icing my back makes me feel more sniffley. So many holiday parties. One or two a day. I never even mentioned this one from Monday. A small holiday gathering for Diplomat Motel, a team I perform with at iO. 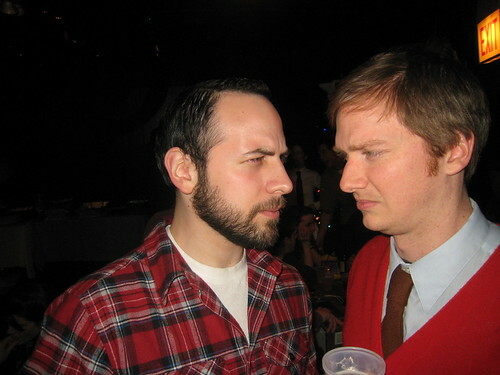 It was the usual improv team Christmas party. Drinking. 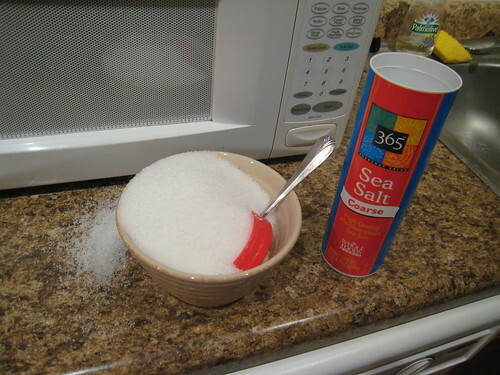 Eating. Making up a weird game that involved unpleasant physical challenges. 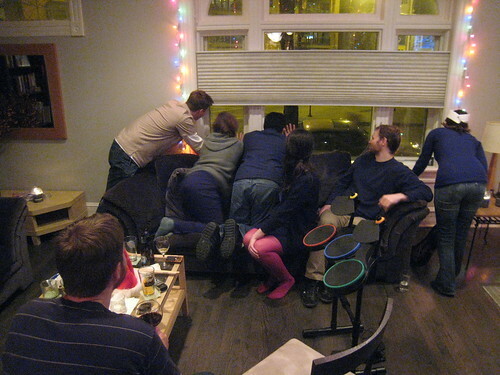 In this picture, most of the cast watches out the window as Tristan runs around a strange parked car fourteen times. 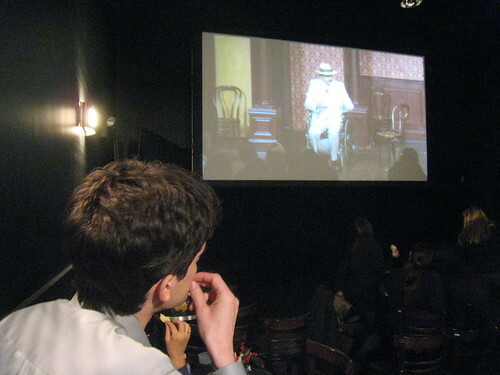 The iO Theater holiday party. I ran into Adal and Louie who have recently gotten some internet notoriety for a prank Adal played on Louie. Louie went out of town for a few weeks, leaving a key with Adal so he could check on his mail, etc. Adal invited dozens of improvisers over and wrapped everything in Louie's apartment in Christmas wrapping paper. TV... wrapped. Curtains... wrapped. Toilet... wrapped. Even small things, shampoo, books, all the food in the refrigerator... all individually wrapped. Me: It seems like it's going viral pretty fast. Adal: Yeah. You can check the stats on the site and it's the number one most watched video of the day... in the Netherlands. But still. Me: But still. Mark my words, this is going to end up with both of you on a talk show next week. Apparently the original idea was to fill Louie's apartment with balloons. So many balloons that he wouldn't be able to walk in. And they'd leave a note and a pin hanging from his front door. But they found out at the last minute that Louie is deathly afraid of balloons popping, so they decided to be nice and go with the wrapping paper idea instead. Last night was also the annual fancy Christmas dinner with Nick, Trupe, Young, Hansen, Martin and Meador. We got dressed up and ate steaks at the Primehouse. 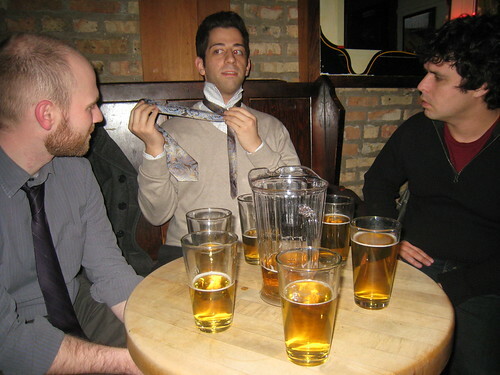 Later we went to the Gingerman for beers. Trupe showed us how to tie a windsor knot. 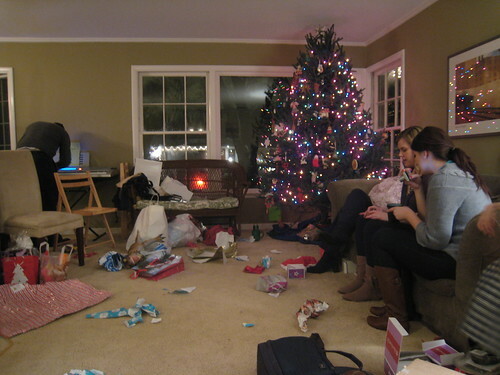 Glynn and Brooke hosted a Whirled News Christmas brunch at their place. Eddie brought his second daughter, Amelia, who had just been born 48 hours ago. Eddie: She's real new. The price tag is still on. Sarah and Megan: [at same time] So you could still take her back? We re-signed the lease (after negotiating the rent down, which I'm kind of proud of because I'm generally not good at those sorts of things). So, another year in the apartment. 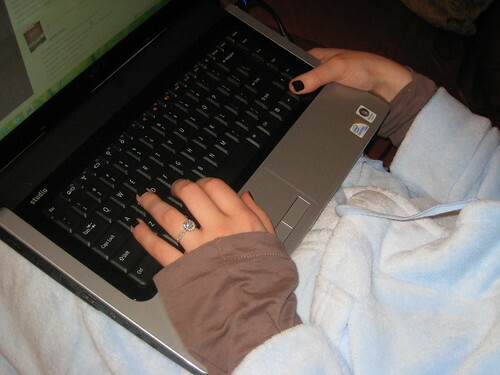 It did occur to me though, that moving out of the apartment would have made a decent end to the blog. When in doubt, book ending works. Oh well, I guess I'll have to come up with something else to end the blog. Second City, one of Chicago's most historic theaters (comedy or otherwise) is celebrating its 50th anniversary this weekend, with some incredible shows and reunions. Steve, a TourCo performer, got me in to the SCTV reunion show party as his "plus one." A big chunk of the original cast of that classic TV show reuniting for a night of live theater. We weren't in the theater itself (those tickets were crazy expensive) but got to watch the show simulcast on big screens in the fancy new training center space in the building. Ed Grimley. Edith Prickley. Count Floyd. Pretty incredible. Sure, there was a bit of a disconnect, watching it projected rather than live. We'd hear the tinny roar of applause through the speakers between sketches, and in our room upstairs, a round of real applause would start and then awkwardly sputter out, people wanting to show their appreciation, but also feeling a bit odd, because, well... they couldn't hear us. And I mean no insult by "moderately obscure." Sure, a lot of bigger names will be in the building tomorrow, but I was genuinely jazzed to see "that guy from 'Not Necessarily the News'!" 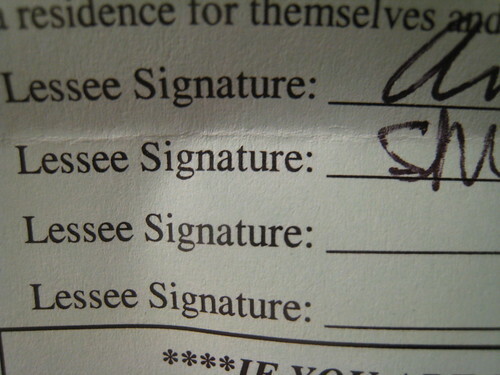 And yes, I saw several celebrities whose names I do know, but I'm not going to write those here because, like stumbling across a YouTube video of some show that's been lodged in your brain since childhood but you could never remember its name and sometimes questioned if it existed at all... I was a lot more excited to see "that guy from 'Herman's Head'!" We had drinks and an amazing dinner at Roy's a fancy Hawaiian-fusion place. 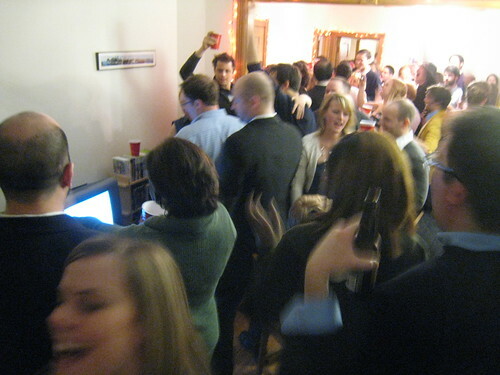 There was a lot of debate all week about where to go for the after-party (karaoke? bowling?). Numerous company-wide e-mail surveys. Finally we settled on buying a bunch of booze and coming back to the office to drink and hang out. That may sound kind of boring ("why would you want to go back to your office?") but it was inexpensive and fun. Chris, by the way, has a (totally deserved) reputation for giving terrible speeches at our parties. This year he was half-jokingly (but half-seriously) forbidden from giving a speech at dinner from the higher-ups. 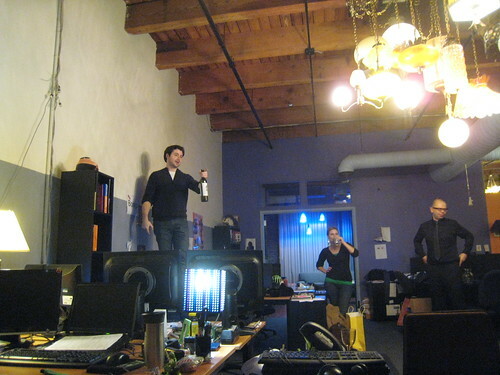 When we got back to the office, though, he stepped up on a desk to make a speech. I'm not sure what he said, because we were all too busy boo-ing him. The bitter winter weather is sweeping in. 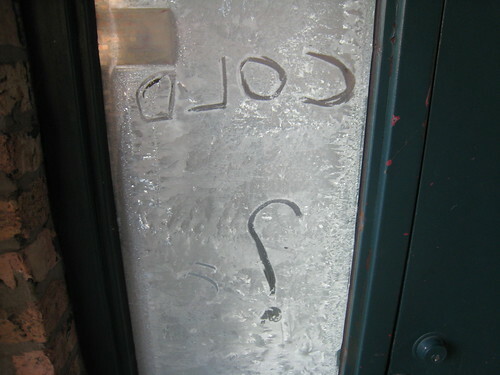 Someone wrote this in the frost on the front door to our office building. I imagine it mocks people waiting at the call box to be buzzed in for an interview or office visit. It's clearly written from inside. "Cold? Are you cold out there? Pretty cold out there, huh?" I received a surprise package in the mail from Mom. 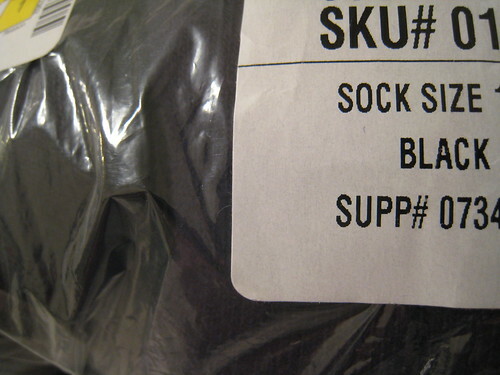 Black socks! I could definitely use some black socks. I wondered why she sent them to me right before Christmas, though. Maybe she was thinking that it's no fun to get socks for Christmas, but it's super-awesome to get socks BEFORE Christmas! Sarah bought a little tree and some Christmas decorations. 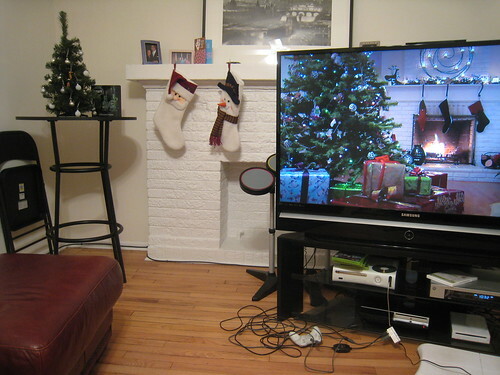 We set them up, while listening to Christmas music and watching festive holiday HD Screensavers on the TV. Sarah: It's like our Christmas stuff is watching the stuff on the TV thinking, "Oh man.. someday I hope I get big like that." Went to the fundraiser for the Donna Fund. 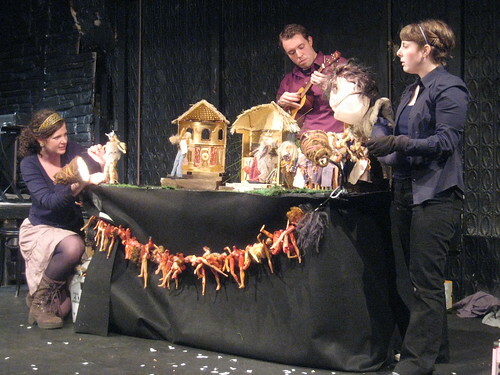 A number of great comedy art pieces(/sketches) including Lacy's interpretation of Beowulf using 40-some Barbie dolls (pictured). If you would like to make a donation to the fund, which raises money to offer dance scholarships to children and buy portable DVD players for children in hospitals, I have the information in the comments section. Marc: [giving speech at reception] I'd like to thank Odette's parents for raising such a wonderful, amazing daughter. And I'd like to thank my parents... for raising... such a wonderful amazing son! 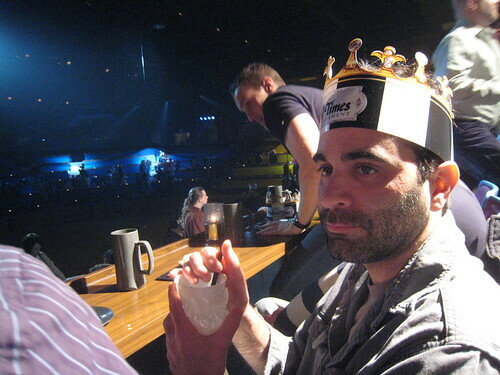 We surprised him by starting the evening at Medieval Times, a giant castle-shaped building in the suburbs where you eat a meal and watch a medieval jousting and stunt show. Our knight, the Black and White Knight, won, somehow surviving being stabbed in the stomach about four times (by my count). So, he won, but he's probably dead now, right? The only disappointment was that we didn't think to submit an announcment about Marc's impending wedding. We didn't know it was an option until the King was already reading off a long list of birthdays and anachrostic sounding corporate groups. King: I am pleased to welcome to my kingdom... [reading] "AKA Marketing, ______ _____ who is celebrating an eight birthday, Nexus Logistics..."
Well, Officer _____, detinting the car windows wasn't as easy as just scraping it off with a razor blade like you suggested, but I was able to do it myself. Sarah looked up 'how to' videos on YouTube, which is basically where she goes to answer all questions these days. The best approach seemed to involve using a steamer. We don't own a steamer, and my attempts to borrow one fell through (FYI: if you post something on Facebook about needing to borrow a steamer, you will mostly just get lots of amusingly vulgar jokes in response), so we bought a cheap little handheld travel SteamBuddy. The side windows were surprisingly easy. 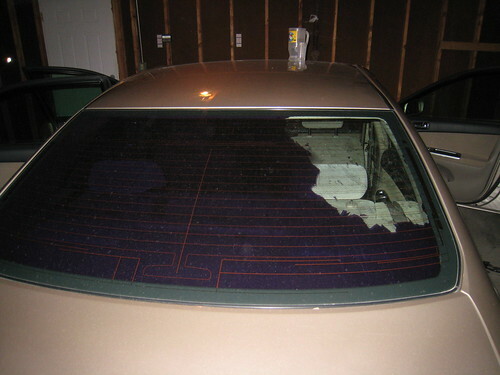 But the back window was a terrible multi-day ordeal. Steam a little off, scrape. Steam a little off, scrape. Plus, I started to worry that I could damage part of the back window defroster. Finally I switched to using a hair dryer and it was more effective, allowing me to pull larger chunks of tinting away at a time. This may have been easier going if it weren't frigidly cold outside. But it's done. And I feel sort of off, after spending so many hours in the back seat inhaling steam, hair dryer exhaust and window glue. This just hasn't been a good week for me. Me: I know. I know. I've been putting off getting the tinting removed because I'm worried about how expensive it'll be. Officer: Just scrape it off yourself. Me: I can do that? Officer: Yeah. Just scrape it off with a razor blade. Why pay somebody else to do it? For a second I thought about saying, "But look at the mess on my windshield from all those old city stickers I couldn't get off properly." 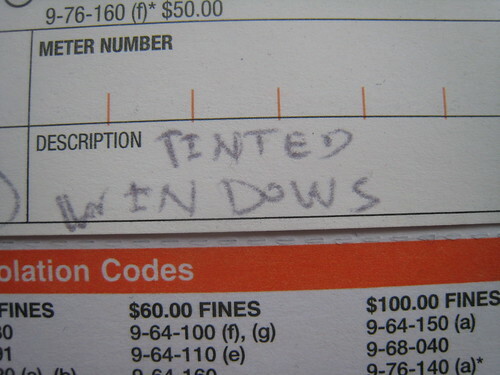 Then I thought better of drawing attention to the fact that I've lived in Chicago with tinted windows for many years.